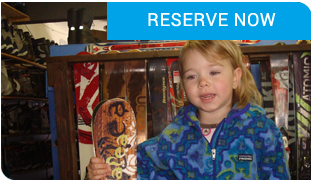 The Ski Renter offers quality ski rental equipment custom fitted for the beginner or expert. We carry a complete line of demo and performance skis, boots, clothing, X-country, snowboards and children s equipment, Our skilled technicians are experts in ski & snowboard repairs and tuning. After 2:30 pm you can rent for the next day. And once you’ve rented from us once, you can simply call ahead or log back into our online reservation system to reserve your equipment! We’re located in the heart of Mammoth, at the corner of Main St. (Hwy. 203) and Old Mammoth Rd., next to the Shell Mart Center and the Breakfast Club. RATES & PACKAGES – Please take a moment to shop our rates and packages available before reserving online. Please not the packages in the rates sheet are clickable into the reservation system. 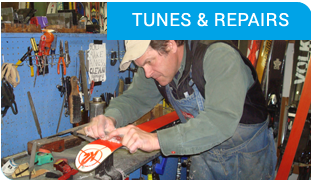 TUNES & REPAIRS – At the Ski Renter, our technicians will maintain your equipment while getting the best possible performance out of your skis and snowboards based on the snow temps. RESERVE NOW – Renting your equipment online will save you time and money. 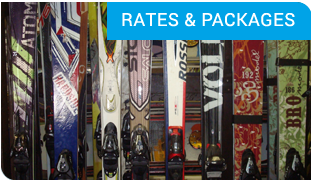 We have packages to fit all skier types and ability levels. Please give our new reservation system a test drive!